With the ladies of GTI. 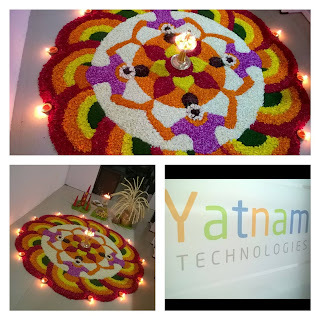 The beautiful designs shown in this post may look like something out of a kaleidoscope, but actually they are flower designs called pookkalam. More than flowers, these designs require an immense amount of patience to create. The green and dark purple colors are the hardest to come by. Green is taken from a particular plant, which needs to be cut very finely by hand. The dark purple petals are very tiny and must be taken off of small flowers. 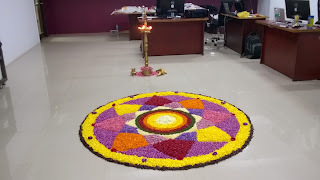 The pookkalams in this post were seen in the Geo Infopark (Kakkanad, Kochi) building for the Onam celebrations on August 25, 2015. 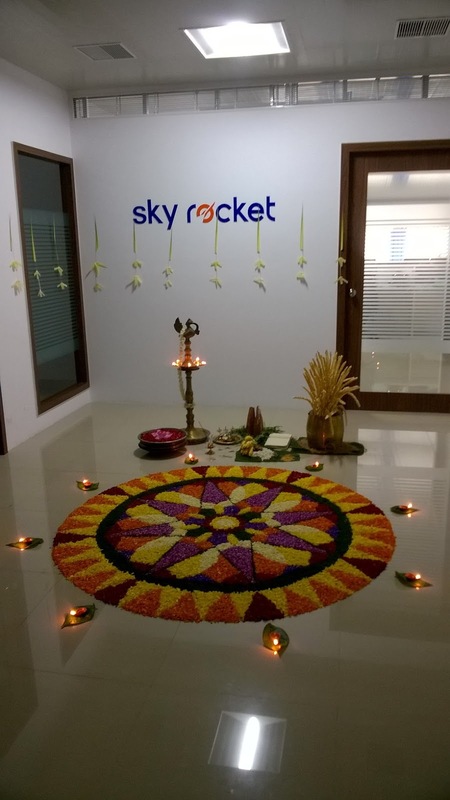 Companies that participate typically place their pookkalam in the reception area of their company. Pookkalam artists and flower cutters and placers start as early as the night before with their designs and flower preparation. 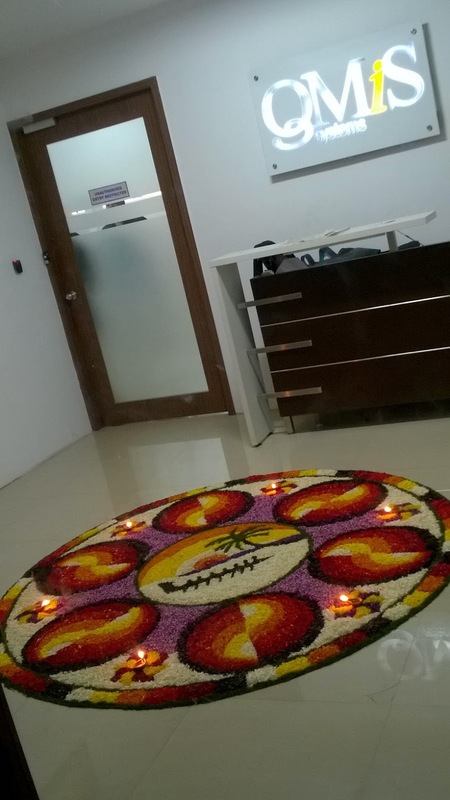 Around 11am most of the companies in the building complete their designs. 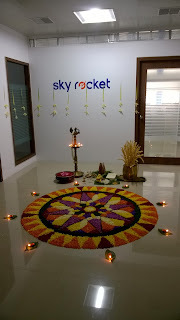 At this time, teams from companies tour around the building going from office to office seeing the designs, taking photos. I also joined in that activity. The images collected during this tour are shown in this post. Enjoy! 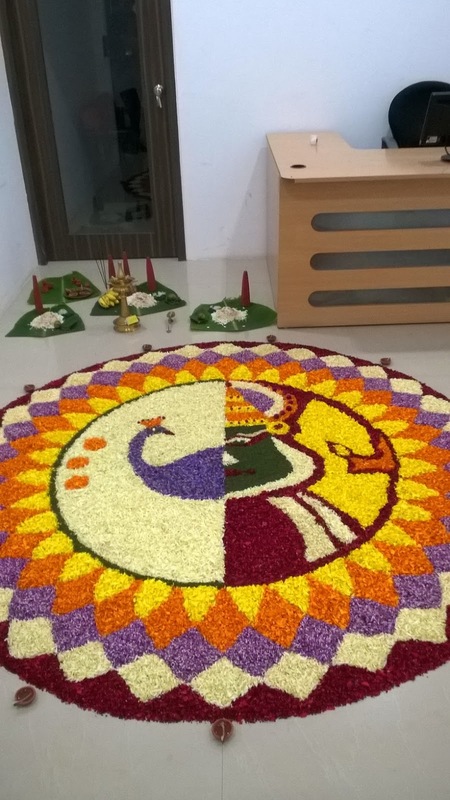 This design depicts the Kerala dance, thiruvathira as danced by ladies. If you look closely, you can see the ladies in purple blouses clapping their hands together. 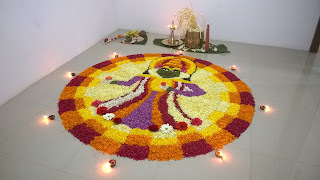 What does it take to make these amazing pookkalams? 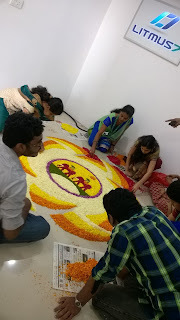 It takes teamwork, patience, creativity and passion! Token picture with Maveli. This was my first ever photo with Maveli. 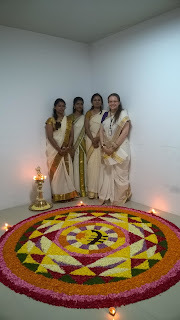 Along with me stand team members of Litmus7. Jennifer Kumar works side by side with your offshore and onsite teams to build effective and productive, culturally competent global, distributed software teams. Learn more about our programs here.